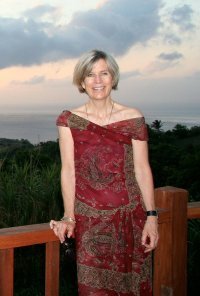 Linda Sills is the Program Development Director for the Global Issues Network (GIN) in cooperation with the Association for the Advancement of International Education and The Washington International School. She is committed to creating and supporting an effective network to further collaboration of the environmental efforts made by all of the international schools. To achieve this goal, her main responsibilities are to assist schools around the world to form GIN groups, organize student GIN Conferences and to create a Global Issues Network(GIN) website connecting every region of the world. After working three years in the Philippines for EARCOS, she continued her work last year virtually from her home in Berkeley. She organized the inaugural GIN conference for EARCOS, EARTH ‘S HOPE (in honor of John Liu) held at Western Academy Beijing in 2008 and “We Can. We Will” hosted by International School Bangkok in 2009. John Liu was the keynote speaker for both of these conferences. The GIN conference is for students and their advisors to assist and support them in addressing identified global issues by creating sustainable networks and solutions. Linda received a BA from UC Berkeley, a MA from Harvard, and a MA from Tufts University. She has used her education both in and out of the classroom to assist her in working in six international schools around the world as a teacher, counselor/school psychologist and now to plan innovative professional development for the creation of a GLOBAL GIN network.